The amount of biking in the U.S. more than doubled during the aughts, from 1.7 billion trips in 2001 to four billion in 2009, according to the League of American Bicyclists, a national advocacy group. One of the great things about this boom is that it has created a broader demographic of people who ride. In a report published last year, the League found that cycling saw the fastest growth over the last decade among Latinos, African Americans and Asian Americans, from sixteen percent of all bike trips in 2001 to twenty-three percent in 2009. The study also found that eighty-nine percent of people aged eighteen to twenty-nine have a positive view of cyclists, and seventy-five percent of them feel that improved conditions for biking would make their community a better place to live. 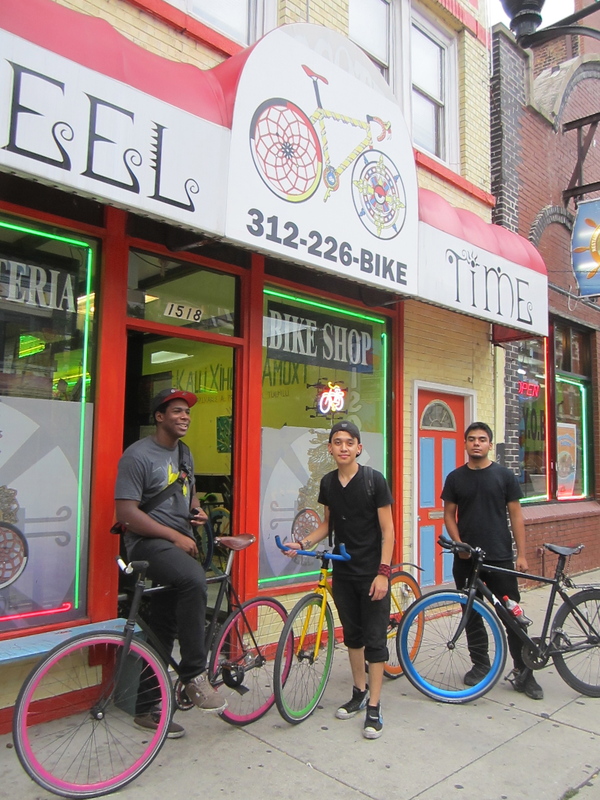 The recent trend toward fixed-gear bicycles and single-speed bikes with freewheels has helped fuel the growing popularity of biking among urban youth in Chicago and other big cities. These sleek, minimalist rides are affordable, fast and easy to customize, which makes them an appealing gateway to cycling for young people who, a decade ago, might have been more interested in buying four wheels than two. Fixies have helped change the face of Chicago’s Critical Mass. For most of the years since it launched in the nineties, the huge ride has drawn relatively few teens and people of color. Recently, the Mass has become more diverse in general, but nowhere is that more obvious than in back of the Picasso, where dozens of youth, of all races, hang out and do tricks on their single-speeds before the ride gets rolling each month. Nowadays, young single-speed riders, many of them black and Latino, are also a fixture at Logan Square’s eagle-topped Illinois Centennial Monument. The bikes have become so popular in Chicago that there are now at least two shops that sell almost nothing but fixies. One of these is Phixx 606 Cycles, located at 4075 North Elston in the Irving Park neighborhood (Phixx606Cycles.com, 773-969-1148). The other is Wheel of Time Bikes, 1518 West 18th in Pilsen (Facebook.com/WheelOfTimeBikes, 312-226-2453). 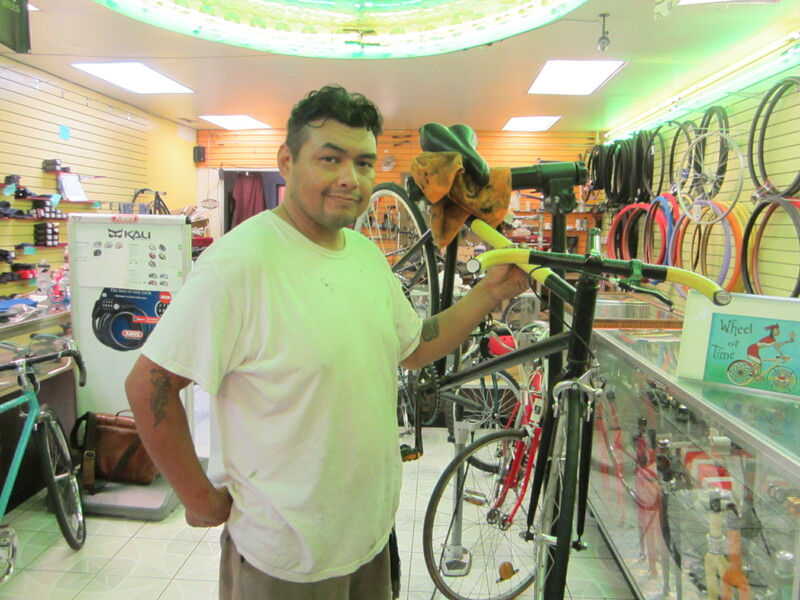 I dropped by last week to find out more about why fixies resonate so much with Chicago youth. Owned by artist Vianey Valdez and her mechanic husband Angel, this shop in a largely Mexican-American community features imagery that honors indigenous cultures. The name refers to the Aztec calendar wheel, which makes up the front wheel of the fixie in the logo, and the other wheel is a Lakota dreamcatcher and sacred hoop. Valdez also painted a phrase in Nahuatl, the Aztec language, across a wall of the store. A disco ball and dozens of silver CDs stuck to the recessed ceiling of the shop are leftovers from its previous life as a record store. Bike frames, rims, tires, chains and other parts and accessories in a galaxy of colors hang from the walls. The shop only stocks one bike brand: Los Angeles-based Pure Fix Cycles. Patlan, forty-two, says young people dig single-speeds because they’re simpler to operate than a bike with derailleurs and multiple gears. Since it’s possible to stop a fixed-gear by slowing your pedal stroke or skidding to a stop, some fixies don’t even have hand brakes. Fewer components on a bike makes it lighter and easier to maintain. Wheel of Time specializes in custom builds, and many people choose unique color combos. “It can look like a rainbow if you want, and people really like that,” Patlan said. Customers are encouraged to name their steeds, and the shop posts photos of each new creation on its Facebook page. Recent additions include “Earth and Sky,” a green-and-blue model, “El Che,” with a red-and-black color scheme, and “The Hulk”—a grey frame with neon green parts. They turn their attention to Mendez’s Pure Fix, which features a yellow frame, a green front wheel, an orange back wheel, and blue handlebars, plus parts in a few other hues. “What colors do you want to put on here?” Lopez asks. “I don’t know what other colors I can put on here,” Mendez replies. Previous Post Dime Stories: Welcome to Dystopia!